Today we’re taking a look at a mid-range racing wheel and pedals, the Speedlink Trailblazer. 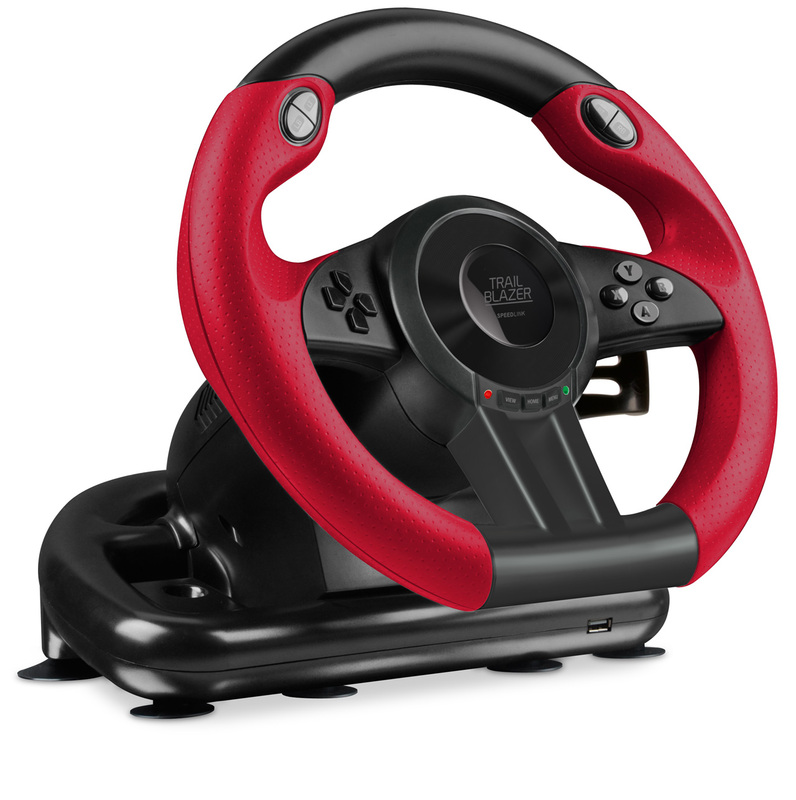 This racing wheel certainly looks the business, but how does it perform in Dirt 4? Let’s put it to the test! The Trailblazer is quite ordinary in many respects, with a typical rim diameter of about 250mm or 10 inches, a dimpled section on each side and 12 buttons. We have all four shoulder and trigger buttons along the top of the wheel, with a d-pad on the left and face buttons on the right. Start, select and home are the tiny buttons towards the bottom centre. Looking at the back and side of the wheel now, we have a bump shifter on the right, mapped to L1 and R1 by default, and paddle shifters in their usual positions behind the wheel. The Trailblazer sticks to your desk (or what-have-you) via seven suction cups; no option for a clamp is available. There are two pedals provided, for accelerating and braking; no clutch use is possible here. There’s a flip-out pad built into the pedals, which provides a place for your feet to rest at a comfortable level (probably best used on thick carpet). The pedals for the unit attach to the back of the wheel via what looks to be an old-school RJ11 (i.e. modem-style) cable, which is 1.6 metres long. The wheel itself attaches to a PC via a 2 metre USB cable, and the wheel has a USB port on the front for another device to be plugged into it if required. 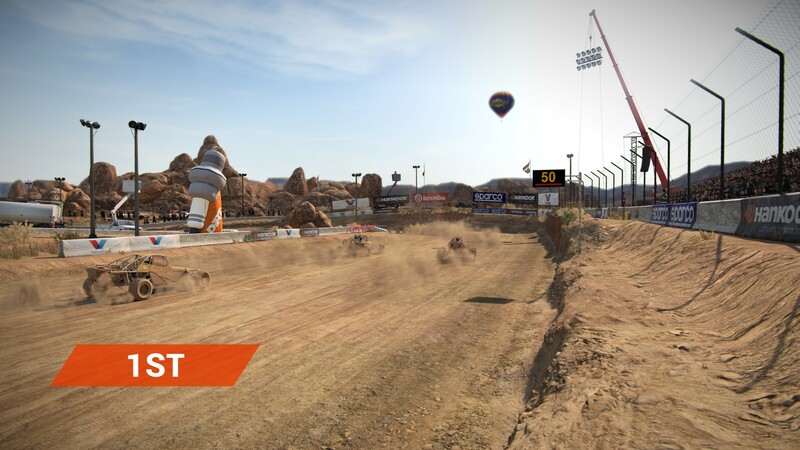 We tested the Trailblazer with Dirt 4 for a period of ten hours, trying out all of the available modes available including rally, rallycross, landrush and joyride. Here are our impressions. First of all, the driving experience. The wheel itself feels solid enough; it’s a reasonable size and feels natural to move from side to side. The dead zone of the wheel is a little larger than others we’ve tried; this didn’t bother us but it made small and precise movements challenging (some stages in the tight and twisty landrush mode became overly difficult on the wheel compared to a gamepad). The pedals feel fine to use too, although some may miss the option for a clutch (not us). It’s nice to have the choice of a bump shifter or paddle shifters too. Both are nice and clicky, with the aural feedback and minimal travel distance providing the capability for extremely rapid up and downshifts. The start and select buttons are a little difficult to reach while racing (for that all-important rage-quit), but the other face buttons are perfectly accessible. The biggest problem we found in our testing was the stability of the wheel. The seven suction cups simply didn’t provide a lasting connection to our (glossy) wooden desk, frequently becoming unstuck when taking hard corners. If driving a rally stage wasn’t difficult enough, having your wheel turned 90 degrees will definitely cause some frustration. Adding water helped, but re-applying this proved to be a pain. We would have greatly preferred a clamp system, as this generally provides a much more secure grip that can last throughout a gaming session. You can use suction cups in more situations and they allow you to remove the wheel from your desk much faster, but these advantages aren’t enough to make up for the annoyance caused by the frequent unsticking. Another small flaw was the length of the pedal cable. 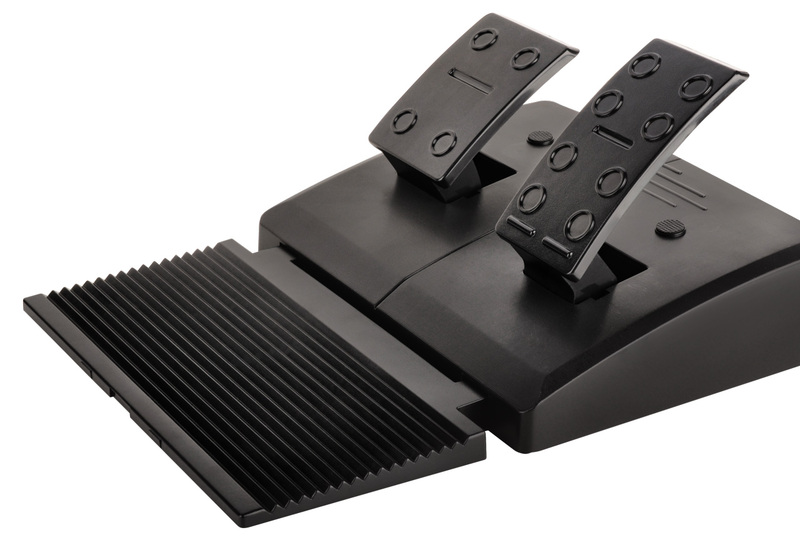 With the cable reaching directly down from the desk and back to the pedals, it brushed up against our legs; with the cable behind the desk we needed to disconnect the two units when placing the wheel next to our PC when playing other games or writing reviews. Reaching 2 metres instead of 1.6 metres would have been a welcome upgrade. Finally, the paddle shifters, bump shift and two buttons near the top are all mapped to the same thing: L1 and R1. Unfortunately, that means that you can’t map these physical controls to different in-game commands; they can only be changed en-masse. That means you can’t use the top buttons for functions other than shifting, which would have been quite handy in games with plenty of buttons (e.g. American Truck Simulator, Dirt 4). 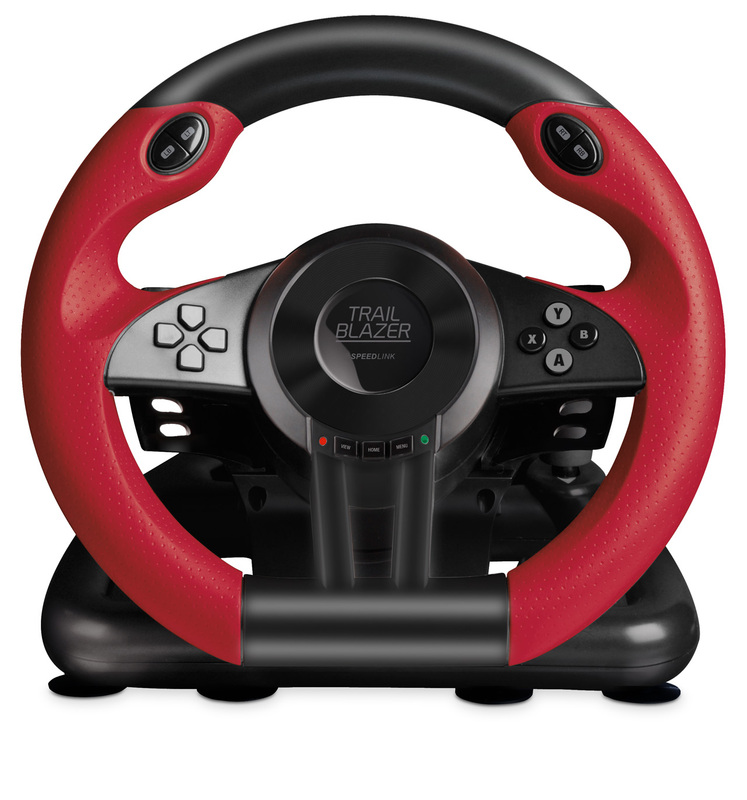 The Speedlink Trailblazer is a viable racing wheel, made from strong materials and with a generally sound design. 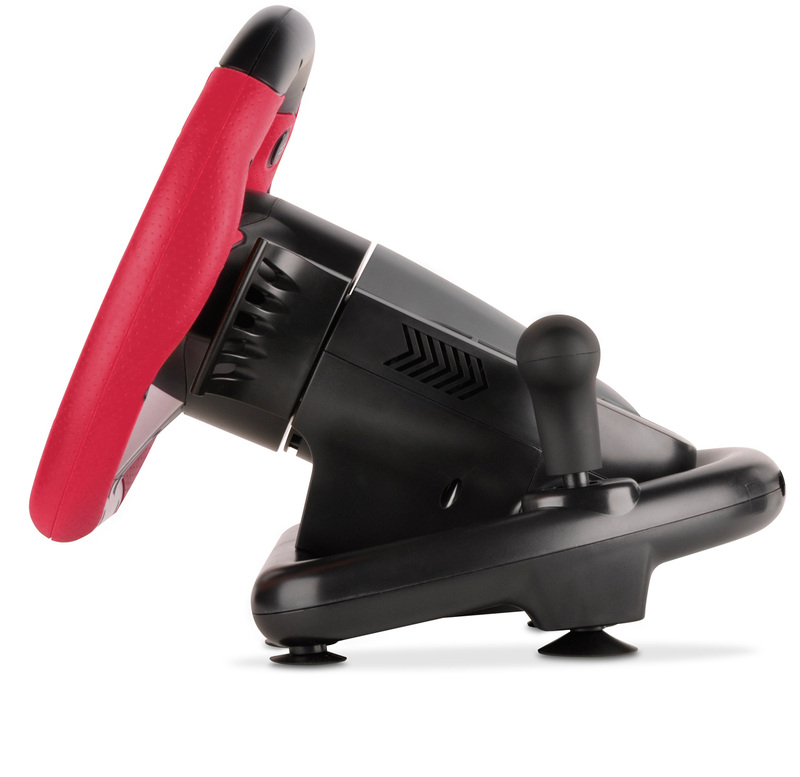 The option for both paddle and bump shifting is a nice bonus, while the wheel’s wide compatibility with PC, Xbox One, PS3 and PS4 is also a plus. However, the suction cup mounting system of the wheel is not good enough for some surfaces, and you may find an equivalent wheel that uses a clamp is a wiser investment. Still, if the Trailblazer is available for less than its £90 RRP online, it’s still worth a try.